Oaklands Elementary School Green Space is in the city of Victoria, B.C., one of thirteen communities that form the Capital Regional District of British Columbia. 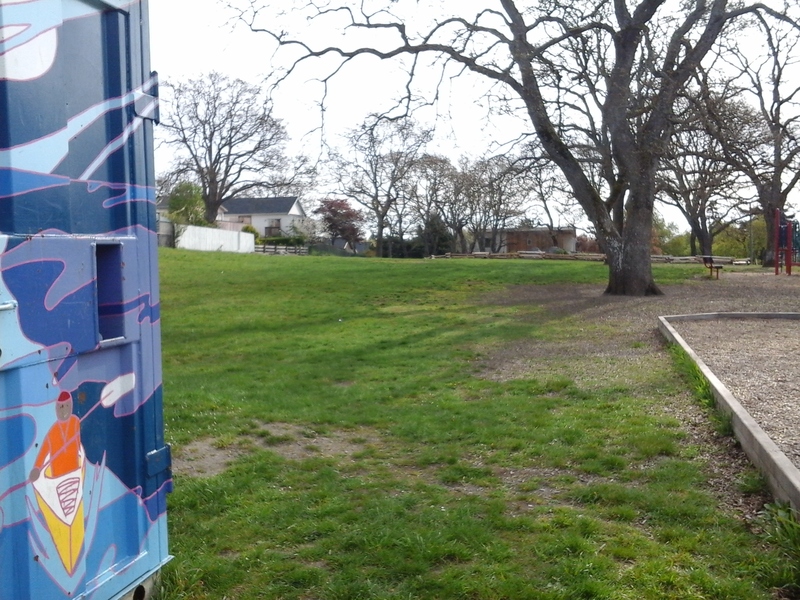 This green space contains several Garry Oak trees and a split cedar fenced native plant garden all surrounded by a large grassy area. It is balanced by the striking brick and concrete Oaklands Elementary School building built by nineteen thirteen. There are three play areas that form this green space. They are available outside of school hours for the Victoria School District 61. One play area, on the north side of the school, is set in a natural grassy area with Garry Oak trees and an diverse playground of spider web cable net and climbing towers. Located in this area is the eye catching Currents mural, a beautifully painted shipping container completed by Caroline Stengl with cooperation of the members of the Oaklands Community Center. The Community Center is also based out of the school buildings. Another play area is a large grass cover field across Belmont Avenue from the school. This grass covered sport field has white goal posts on either end. The third area is to the south side of the school building and includes a playground, basketball courts and other areas for organized outdoor activities. The small grove of Garry oak trees Quercus garryana provide shade of these areas. This green space is included in the Oaklands Greenway Loop. The loop includes Mt Stephen Ryan Park, the Jewish Cemetery, Ryan Ivy Green, Ivy Place Knoll, Oaklands Green, and Ryan Hill Park. David Spencer Park is across Ryan Street and Oaklands Park is slight further east along Ryan Street. Oaklands Elementary School Green Space can be reached from the Trans Canada Highway. Turn east onto Hillside Avenue and continue to Belmont Avenue. Turn south on Belmont and look for the brick school building the east. There are several parking areas which are in use during school hours. A bus travels along Hillside Avenue from downtown to the University of Victoria.